I was so happy to get comments on the Focaccia Giardiniera that I’m sharing another little creation. I call these “Focaccia Muffins” because that’s what Mariano’s calls them and that’s where I got the idea. I saw them in the store, thought they looked cool, then went home and started playing around with focaccia dough. The technique I used for the muffins was to slather a rectangle of focaccia dough with store bought sun dried tomato pesto, sprinkle with shaved Parmesan cheese, roll up jellyroll style, cut into rounds, then squish rounds of filled dough and chunks of cut-up rounds, into muffin cups. For color and texture, I sprinkled on some red, green and yellow cooked peppers along with some delicious sliced olives. I feel like this recipe is still a work in process, but since I’ve made it three times already and my daughter loves the muffins, I went ahead and posted. Create your own version! 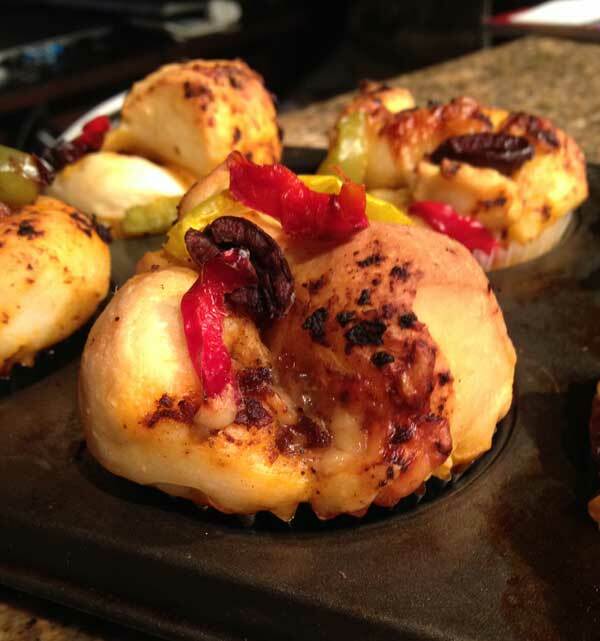 I’ve only made sun dried tomato pesto flavored focaccia muffins, but there are so many potential variations. If you already have a great focaccia dough recipe you can use that one, but this particular dough works really well because the olive oil makes it slick and smooth and you can just press it right into a rectangle on an un-floured surface. Also, I was unsure whether the muffins would work the first time, so I only used half the dough for muffins (6 total) and just baked the other half of the dough as an an 8 inch slab of regular focaccia. The recipe is pretty easy, but if you have any questions let me know. Put the flour, yeast, sugar, and salt in the bowl of a stand mixer. Add the water and 3 tablespoons of the oil and rosemary and stir until you have a very sticky dough. Using the dough hook, knead the dough until it is smooth and elastic. It should be slick and firm. Put the remaining oil in a large bowl, add the dough and roll it around so that it's nice and slick. Cover and let rise for about an hour. Punch down dough and divide it in half. Put aside one half of the dough to use for more muffins or to make a small slab of focaccia. On a clean work surface such as a large cutting board or a big sheet of waxed paper on a counter, press the dough into a rectangle about 9 inches in length and 6 inches in height. Brush the rectangle with sun-dried tomato pesto and sprinkle with shaved Parmesan cheese. Roll into a cylinder as if you were making cinnamon rolls. Have ready 6 muffin cups lined with paper liners or just well greased. Cut the cylinder into 9 rounds and place 1 round in each of 6 muffin cups. Cut remaining mounds into quarters and stack two quarters on top of each round. 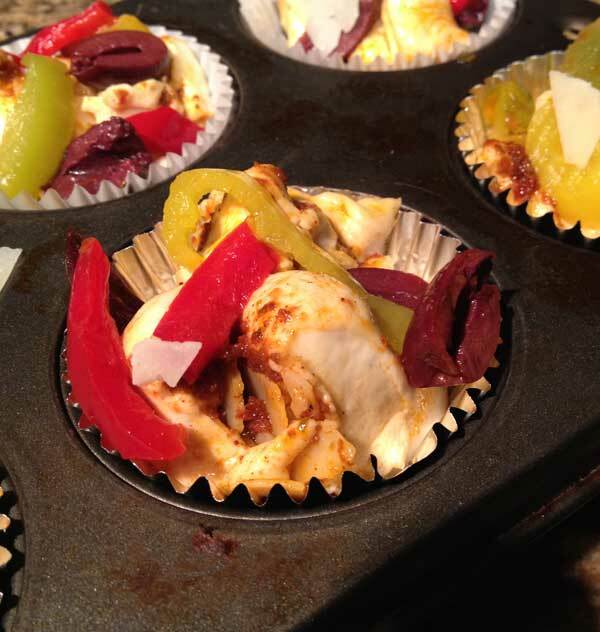 Sprinkle with sliced olives and bits of colorful cooked peppers (red, yellow and green). Let rise for 30 minutes. 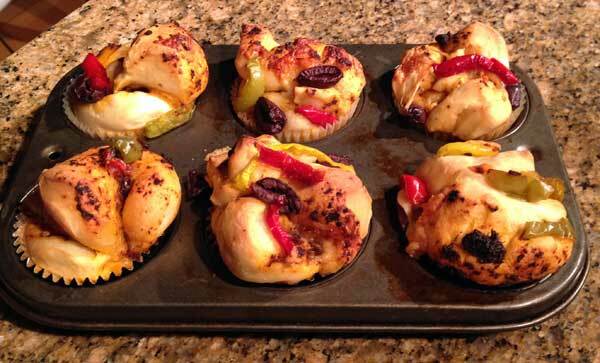 Preheat oven to 375 degrees F. and bake muffins for about 25 minutes or until they are cooked through. Let cool for 20 minutes then remove from tins. Thanks so much for trying the recipe and taking the time to comment. Maybe next time you can try cutting it all up and putting it into muffin pans, but I’m glad you approve of the focaccia dough recipe and that you had fun being creative with the toppings. I’ve tried a lot of focaccia recipes and this is the one I keep coming back to, so thanks for the validation. Also, I always use the maximum amount of flour, too. For me, 375 grams is almost always 3 cups, but some people scoop heavier so I try to put in a range for those who scoop heavy and don’t use a scale. It was barely zero degrees here in Pittsburgh yesterday, so I planned to make a pot of soup for supper. When I saw your recipe, I knew I had to try it to accompany my soup. I was feeling a bit lazy, though, so instead of doing muffins, I made a big tray of focaccia and put all your suggested toppings all over it. I sautéed 4 different colored peppers in a bit of olive oil with some crushed red pepper. Also, because of the lazy factor, I mixed everything in my bread machine through the first rise. I used the max amount of ingredients you recommended and the dough was perfect — just the right consistency. I also used dried rosemary from our garden last year and crumbled it in the bottom of my bread pan so as the water warmed, it would plump back up. This was a HUGE hit in my Italian household and that is high praise indeed. My husband kept sneaking out to the kitchen for more and at one point, I heard him telling our dog that he could have a tiny piece of crust just to see how good it was. Thanks so much for the recipe. What a cool idea! These look so good!!! That’s so funny that Food Network Magazine had a similar recipe at the same time – LOL! D, let me know what you think! What’s funny is last night we were at Target and I noticed the cover of Food Network magazine had something that looked almost the same. They called theirs Pizza Rolls or something like that. I guess the trend of turning everything into muffins or muffin size hasn’t ended yet. So pretty! I’ll have to try these. They look fabulous! My focaccia recipe doesn’t use bread flour, so I’ll see what the bread flour adds. Thanks! Those look like they would be great with soup, salad, or a glass of wine!